What are long tail keywords: How can you find best long tail keywords for SEO? 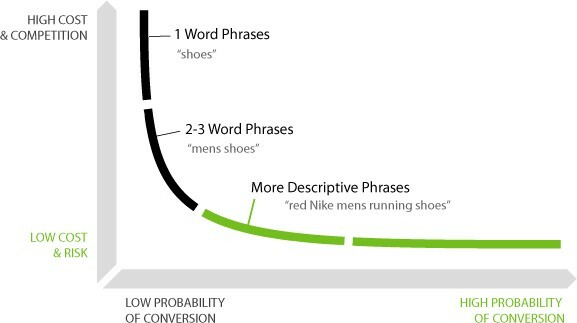 Long tail keywords are longer keywords that contain 3 or more words, which are highly specific and visitor’s more likely use them when searching for something specific. These type of keywords play an important role in Search Engine Optimization (SEO) to drive more targeted traffic to your website. Long tail keywords are easier to rank, due to low competition & search volume other than short tail (head) keywords. Here are the examples of long tail and short tail keywords. Short tail keywords generally consist of only 1 or 2 words. These types of keywords are highly competitive and many times not relevant to user’s query and take more time to improve ranking on organic searches. Long tail keywords consist of 3 or more words. These keywords are low competitive keywords and can be your best choice to get relevant traffic & conversion on your specific searches. As you know that keyword research is an important part of Search Engine Optimization SEO strategy and if it is done correctly then you can get higher ranking and traffic for your targeted keywords on organic search engines. Keyword Research is a process and generally used to find the right keywords for your business. There are many ways to find the best long tail keywords for your business. Use these ways to find the long tail keywords. You can get some good long tail keywords direct from your website content, explore the web pages and their content and find some relevant keywords for your business. This is one of the simplest and efficient ways to find out long tail keywords. Just type search terms on Google and Google will show more suggest keywords for your search terms or queries. This is another simplest way to find related long tail keywords. You can get some good long tail keywords from the bottom of Google search. This is simplest and effective way to find relevant long tail keywords from a list of the search query report. You can find some good long tail keywords from the available search query report. Competitor analysis is a great way to find complete information about competitors strategy. If you know your competitors, check out the keywords that your competitors have targeted if you find relevant then use them into your keywords strategy. We at FODUU offer best SEO and SEM services with quality results and affordable prices in India.